This week, one of the all-time defensive greats for the Green Bay Packers was in Milwaukee for a youth camp. Gilbert Brown hosted his 11th annual All Pro Football Camp at North Division High School on Wednesday and Thursday. In addition to football instruction, Brown also teaches the campers discipline and respect. There were sessions available for both 8-12 year olds and 13-17 year olds. The first session ran 8:30 a.m. to 12 p.m. each day while the afternoon period was from 2:30 to 5:30 p.m. Admission to the camp was free. Brown played 125 games in his NFL career, all split across two stints with the Packers. His play as a nose tackle was essential to the franchise’s rise in the 1990’s. Nicknamed “The Gravedigger” for his iconic celebrations, Brown recorded 292 career tackles. In 1996, he was a member of the Packers team that won Super Bowl XXXI. 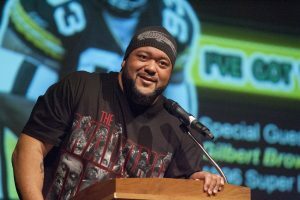 Brown retired in 2003 and was inducted to the Green Bay Packers Hall of Fame in 2008. Since leaving the playing field, he has coached teams in the Continental Indoor Football League, Indoor Football League and Lingerie Football League. If your company is interested in finding out booking fees and availability for a Football Celebrity like Gilbert Brown or other sports celebrities for a Keynote Speech, Product Promotion, Guest Appearance, or Football Camp, call us at 1-888-246-7141.